For other uses, see Raven (disambiguation). The term "raven" originally referred to the common raven (Corvus corax), the type species of the genus Corvus, which has a larger distribution than any other species of Corvus, ranging over much of the Northern Hemisphere. The modern English word raven has cognates in all other Germanic languages, including Old Norse (and subsequently modern Icelandic) hrafn and Old High German (h)raban, all of which descend from Proto-Germanic *hrabanaz. 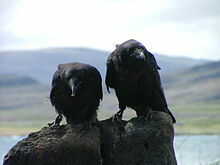 Collective nouns for a group of ravens (or at least the common raven) include "unkindness", "treachery", and "conspiracy". In practice, most people use the more generic "flock". ^ Oxford English Dictionary entry for "raven." ^ Simpson, J.; Weiner, E., eds. (1989). "Raven". Oxford English Dictionary (2nd ed.). Oxford: Clarendon Press. ISBN 0-19-861186-2. ^ "Raven". Online Etymology Dictionary. Retrieved 14 May 2007. ^ "Baltimore Bird Club. Group Name for Birds: A Partial List". Retrieved 3 June 2007. ^ "University of California Golf Club. List of Collective Nouns". Retrieved 16 July 2008. Wikisource has the text of the 1911 Encyclopædia Britannica article Raven.